What is an Inky Pinky Scrapper? You know how, when you're stamping or ink-distressing your paper you get ink all over your fingers? Well, those are inky pinkies! Because we all end up with inky pinkies when stamping and we all love paper crafting, my team is called the Inky Pinky Scrappers! I joined the Close to my Heart family 7 1/2 years ago after I had attended a CTMH home gathering and discovered their clear acrylic stamps! I was hooked!! Then I read about our CEO, Jeanette Lynton, and how she started this company in her kitchen and built it to what it is today. Jeanette is an amazing woman with a heart as big as all outdoors! She is not only focused on her company, but also on everyone involved with it, from her awesome President, Monica Wihongi, right down to each of us, her consultants. I attended my first convention in Disneyland in 2011 and had so much fun, I have only missed one since. I won't be missing any more! The energy, friendship, information sharing, and creativity is way up there with the stars! Want to get in on the fun? All you have to do is go to my website and sign up to join my team! As long as you live in Canada (except for Quebec and Nunavut), you can sign up with me. You may be asking why. 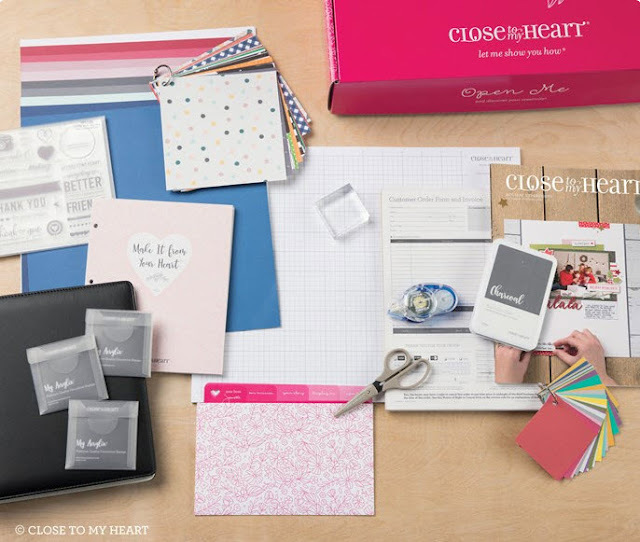 Why should you sign up to be a Close to my Heart consultant? What's in it for you? Well, there is the freedom to choose your own hours of work, the friendships you can build as a consultant, and the knowledge you gain as well, not only in paper crafting but also in running your own business. Close to my Heart has dozens of tutorials and podcasts created by other consultants who share their expertise with all of us! Then, as I have mentioned, there is Convention! The BIGGEST party of the year! At convention, you learn about all the exciting new products in the next catalogue and even try some of them out at creative sessions. Then you have a chance to purchase all of the new product at a huge discount before the catalogue is live! You learn valuable business tips and tricks at business sessions. You earn awards for sales, including incentive trips to places like Mexico, Thailand, and the Caribbean! PLUS you will receive $60 in CTMH Cash right away! That is over $240 in product PLUS $60 CTMH Cash for only $95 CAD plus shipping and tax. Have I piqued your interest? Then head on over to my website and click What We Do, then click Be A Consultant. There you will find more information as well as the Let's Get Started link so you can start your own business today! Welcome to the August Cross Canada Blog Hop where we are highlighting the Documented paper pack. If you got here from Terri's blog, you are in the right place, but if you find yourself lost at any time, just head back to Michelle's blog where you will find the complete list of hoppers. We welcome your comments on our blogs so as you hop through, please tell us what you think. I really like the Documented papers and decided to make the three layouts in the Workshop Your Way. They are so darned awesome and, although they don't have photos yet, I know I will be able to add photos to them later! The Documented Workshop Your Way (G1154 - $38.25 CDN) is available to order until August 31! I added some of my own touch to these by changing out the embellishments to make them work with the upcoming photos from our trip to gorgeous Australia and New Zealand in November! That's it for me this month and since I am the end of the line, head back to Michelle's blog to run through again or to see the list of hoppers. Join us next month when we will be highlighting the Boutique papers from the new 2018 Holiday Expressions catalogue.